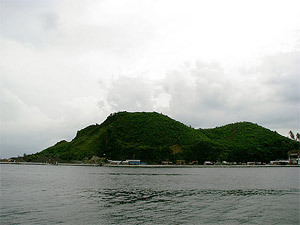 Located on the southern portion of Legazpi City and protruding out to sea is the imposing Kapuntukan Hill, which is fondly called by residents as the Sleeping Lion Hill because its shape looks like a sleeping lion (well a bit of imagination helps). If you want to take a picture of Mayon Volcano and downtown Legazpi City in one panoramic shot, then Kapuntukan Hill is the place to be, as evidenced by this nice photo on Flickr and this one. You might also want to visit Lignon Hill, which I’ve featured almost two years ago. If you want to learn more about Kapuntukan, then this article at the WOW Legazpi website contains lots more information and nice pictures.